The soup is prepared by the special recipe. It is made like at home. Traditional beetroot soup with fresh cabbage, carrots, onions and spices. There is also tomato paste added to the soup in order to make it even tastier.From one jar, it is possible to prepare a meal for thee people. Add 500ml water and warm up for 3-4 minutes. Serve the soup with sour cream and greenery. Preparation: 3-4 portions from one jar. 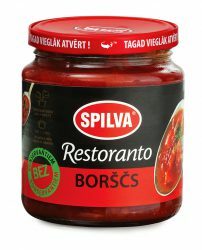 Mix the Spilva Borsch soup with water 1:1 and warm up for some 3-4 minutes. Eat with sour cream and greenery. Product 100 g contains – 82,4 kcal (346,1 kJ) Nutritional value: Carbohydrates 11,2 g, Protein 1,9 g, Fat 3,3 g.